Crashes between cars and bicyclists are on the rise in North Carolina and throughout the United States. The 840 pedal cyclist deaths that occurred nationally accounted for about 2.2% of all traffic fatalities in 2016. (NHTSA) The North Carolina Department of Transportation (NCDOT) reports that there were 18 fatal bicycle crashes and 723 non-fatal injuries in 2016. The number of fatalities was unchanged from the year before, but there were 108 more injuries. The U.S. Centers for Disease Control and Prevention (CDC) advises that the use of bicycle helmets are an effective intervention to reduce the risk of head and brain injuries from bicycle crashes. Wearing fluorescent clothing can help make bicyclists visible from further away during the day, and wearing reflective gear can make bicyclists more visible at night. Putting white front lights and red rear lights will also contribute to greater visibility of bicyclists. The NCDOT’s Division of Bicycle and Pedestrian Transportation has partnered with Bike-Walk NC to create a series of education videos on bicycle safety on North Carolina roads. Chris Kallianos and Jeff Warren are dedicated to helping bicycle accident victims seek compensation for injuries caused by the negligence of others. With more than a half century of combined legal experience, the attorneys at Warren & Kallianos have developed a track record of securing significant awards and settlements for people who have been hurt in traffic accidents, including bicyclists. Bicyclists have the same legal rights to use the road as cars. Unfortunately, a legal right does not always translate into real-life respect. Motorists may fail to see bicyclists because they aren’t paying attention, or they may drive with a clear indifference toward the right of bicyclists to share the roadway. In either case, the bicyclist may be seriously injured. 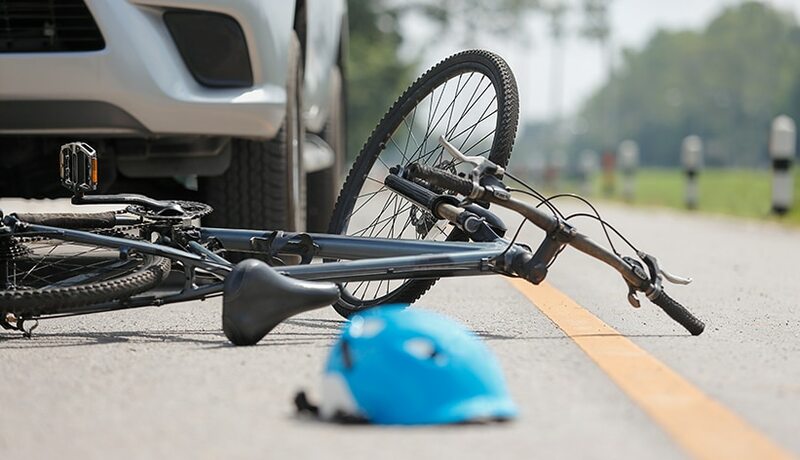 Collisions between bicyclists and cars most often happen when the driver of the car isn’t paying attention or doesn’t see the bicyclist until it is too late. Because bicycles are smaller than cars, they can be harder to spot – and a driver who isn’t paying attention may miss them completely. Here are the most common bike-car crashes, according to the Pedestrian and Bicycle Information Center (PBIC). The Left Cross. A car makes a left turn into the path of the bicyclist who is travelling straight in his or her lane of travel. Although the bicyclist has the right-of-way, he or she pays the price. This type of crash accounts for almost half of all bicycle-car crashes, according to the PBIC, and it almost always results from a driver who is distracted or inattentive. The Right Hook. A driver passes a bicyclist on the left as the car and bicycle are approaching an intersection. The car then turns right at the intersection as the bicycle attempts to go straight – cutting straight across or into the bicyclist’s path. Drivers are more likely to do this when they think of bicyclists as a type of pedestrian, rather than as part of traffic, and bicyclists are more likely to be the victims of this maneuver when they don’t take their share of the lane as they approach an intersection. The Door Prize. A parked car opens its door right into the path of an oncoming bicyclist. Drivers in parked cars can easily avoid making this mistake by using the car’s side mirror to make sure their path is clear before they open the door – but many check only for cars, not for bicyclists. The Parking Ticket. A bicyclist is crossing the end of a driveway or the entrance to a parking lot when he or she is hit by a driver who is pulling out of the lot. While this type of accident is more common when bicyclists ride on the sidewalk, it can also occur if drivers are not paying attention when they pull out. The Side Swipe. A car, while passing a bicyclist, collides with the bicyclist resulting in a collision. This can be due to the car passing too closely, crossing into the cyclist’s lane of travel, or striking the cyclist with an object such as a rear-view mirror or trailer. This type of collision is common in congested traffic areas and roadways with narrow lanes and shoulders. The Rear-End Crash. A bicyclist is riding in the traffic lane, obeying the rules of the road, when he or she is rear-ended by a vehicle. While these accidents are less common than most people believe, they do happen, and they can cause serious injury or death when they do. Often, drivers who rear-end bicyclists are distracted, intoxicated, or careless. All bike accidents are unique, and the type and amount of compensation you may be entitled to receive will depend on the specific factors in your situation. These include, among other things, how severely you were hurt, what losses did you sustain, and how much insurance coverage or other assets are available to pay a settlement or judgment. Lost wages and reduced earning capacity. Compensation for your pain, suffering, and emotional distress due to the crash. The cost to repair or replace your bicycle and other damaged property. If a bicycle accident caused the death of a close relative, you may be able to bring a wrongful death claim to recover compensation for funeral expenses, medical bills, lost income, pain and suffering, loss of companionship, and other losses. Investigate the accident to find out what really happened, who was at fault, and who should be held responsible for your losses. Look for all potential sources of insurance coverage that may apply to the accident, including all available liability coverage as well as any applicable uninsured or underinsured coverage on your auto policy. Work with leading experts such as accident reconstruction experts, medical experts, life-care planners, economists, and others to establish the cause of your accident, the severity of your injuries, the extent of your financial losses, and other important issues. Handle all communication with the insurance companies on your behalf, including aggressive negotiations. Prepare your case for trial and pursue it in court if the insurers are unwilling to make a reasonable settlement offer. Take care of any outstanding liens on your monetary compensation to maximize the amount you take home. If you are worried about how to pay for a lawyer’s services, don’t be. Warren & Kallianos charges no upfront legal fees to victims of bicycle accidents. We don’t get paid unless and until we successfully recover compensation for you. At that time, the fees are paid out of your recovery based on an agreed-upon percentage. If you’ve been hurt in a bicycle accident, you may wonder how you will pay the bills while you recover from your injuries. You may want to know the exact circumstances that led to the crash and who will be held responsible for your injuries and losses. If this sounds familiar, contact a Charlotte bicycle accident lawyer at Warren & Kallianos, PLLC, today for free legal advice. We can help. Attorneys Jeff Warren and Chris Kallianos devote all their work at Warren & Kallianos to helping injured parties and their families. If you’ve been injured in a bicycle crash, don’t wait. Call 704-275-5593 or contact our office today to learn more about your legal rights and options, including your opportunity to build a case for full and fair compensation that addresses both your current and your future needs. Your initial consultation with our office is free and confidential.